Counselling provides an opportunity for you to talk about your problems, challenges and difficult feelings in a safe confidential environment. Your counsellor will listen to you with respect and without judgement. They can help you to express and explore your thoughts and feelings about what is worrying you and make some sense of your responses and experiences. This can help you to feel more settled, confident and in control. 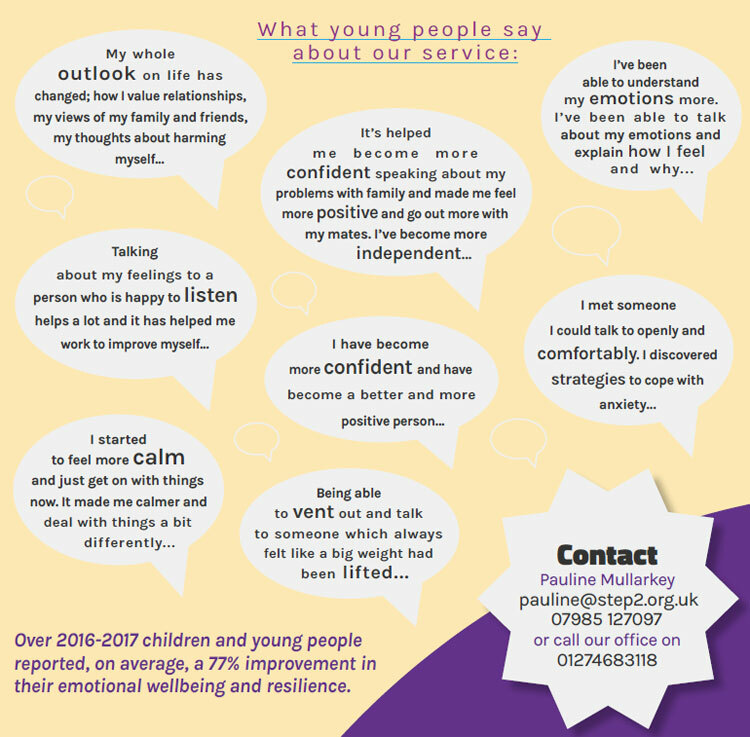 Our Counselling service is available free of charge to young people aged between 11 and 18 years. Sessions are for 1 hour per week and are held in the evenings between 3pm and 8pm. They take place at a number of settings including Keighley Healthy Living Centre, Sunnybank Medical Centre in Wyke and our Step 2 premises in Tong Street. Will my Counsellor tell anyone about what we talk about? Counselling is a confidential space for you to talk about anything you want to. This means that information and things you share with your counsellor about yourself or others would not usually be shared with anyone else. This includes; parents, teachers, friends, social services, family, or anyone else. The only time your counsellor may give out information about you without your permission is when you or someone else is in serious danger. In this case they will need to speak to either the Counselling Manager or the Project Coordinator at Step 2. In such a situation your counsellor will make every effort to talk it through with you before discussing things with someone else. Step2 has a team of counsellors who are carefully selected for their experience and counselling qualifications. They are all fully qualified and are members of the BACP (British Association of Counselling and Psychotherapy). As such they adhere to the BACP Ethical Framework for good practice. They are all required to provide references to show their suitability for the post and pass appropriate police checks. All the counsellors at Step2 have significant experience of working with young people. 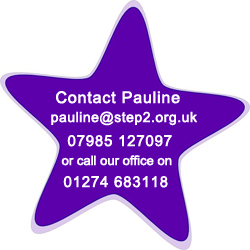 If you think you would like to give counselling a try or want to find out more about it you can contact our counselling manager Pauline for a referral form at pauline@step2.org.uk. or phone Step 2 on 01274 683118. We will then arrange an appointment for you with one of the counsellors. The appointments are between 4pm-8pm on weekday evenings. During the first session the counsellor will explain how they work and you will decide together what the focus of the work will be. You will be given a choice about whether to return. If you chose to engage, you will be asked to attend every week for six weeks. You and your counsellor will then review the work you are doing and decide whether to continue for another six weeks. If you feel that you have done enough, you can end the work there. If you begin counselling with us at Step 2 you will also be offered the opportunity to work with members of your family. Family work consists of up to ten sessions where you and your family are offered the opportunity to work together with your counsellor and another trained therapist to help understand and work through the issues that are bothering you. This is not compulsory and will only happen if you decide that its right for you. Howard was referred to Step 2 for counselling through his GP in February 2014. During the first counselling session Howard explained that he had visited his GP because he had "anger issues" and was also feeling low. The GP had suggested counselling and Howard thought it would be "worth a try". The Counsellor took time to explain the person centred approach (adopted by all Step 2 counsellors. Howard explained that his parents had been separated for several years and that he felt "stuck in the middle" he felt that it was his job to keep both his parents happy with regard to sharing his time between them and he was finding this extremely difficult. He told his Counsellor that he was getting upset and angry and "kicking off" which involved shouting, swearing, throwing things and hitting out at his mum. Over the following few weeks Howard and his Counsellor explored his relationship with his parents in more depth and this led to an insight that he found brought him great relief and empowerment; he discovered that he only ever "kicked off" with his mum and this was because he felt safer with her and therefore felt safe to express his anger and upset. Howard then went on to further explore his "anger issues" and found that he "kicked off" when all his feelings became too much to "keep inside". He expressed a deep sadness about the separation of his parents and a sense of frustration and despair connected to "keeping his dad happy". After several weeks Howard formed an understanding that his relationship with his Dad wasn't as he would like it to be. He also, upon reflection, found that he was able to share his feelings with regard to his Dad with his mum and that this helped to "get rid of things" before they became too much. It was at this point, six weeks into the counselling, that Howard set a goal for himself; he wanted to stop "kicking off" by the end of the twelve week counselling period. After that Howard used every session to reflect on his feelings, experience and behaviour of the past week. He spoke about times when he still had angry outbursts; that they were happening a lot less; didn't last for as long and that he wasn't being physically aggressive towards his mum any more. He felt more in control and "very proud of myself". For the last two counselling sessions Howard shared with his Counsellor that he hadn't had any angry outbursts and was feeling calmer and happier. Howards improved communication with his mum resulted in a schedule being set up with regard to visiting his Dad and he found this incredibly liberating as it was no longer his responsibility to keep everyone happy. Howard ended counselling after twelve weeks. It was a planned, positive ending. The person centred counselling process had enabled Howard to connect with his own internal resources, it offered him the opportunity to express his deepest feelings and to gain insight and understanding which supported him to reach his goal.